I put my daughter down for her nap and started getting things laid out for the Spook City event; costumes, face paints, Halloween gift bags for my niece and nephew, and glow bracelets. I put my shoes by the couch and checked the diaper bag to see if it had enough essentials in it…oh and her sippy cup too! I also placed the camera and my wallet in there as well, as I wouldn’t be carrying my purse. I painted my nails, then about an hour later I began putting make up on my face. I only needed to shade my eyes as I was only going to be wearing a mask. Then I got an idea to draw something neat looking around my chin. 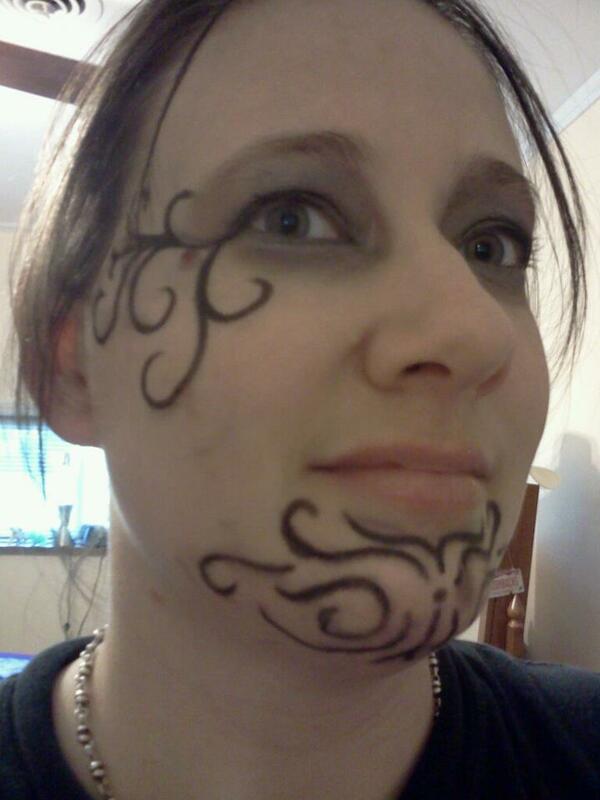 I had a grease make up pen and drew curly lines to look like a tribal beard tattoo. I looked really interesting. My sister and her daughter had arrived and started getting ready, and my daughter was up from her nap and I was getting her ready. Then we were all in the car and headed down the road to Benton. We arrived about an hour earlier than the event started, so I was super excited to get a really good parking spot. We all visited with one another before sending the kids off with my Mother and my youngest sister. I sat with my dad and watched my sister pass out candy, until he mentioned something about antique cars. That’s something he and I have always had in common. We both love classic cars and hot rods. It wasn’t about thirty minutes later when we ran into my Mother and the kids. She had said something about camel rides. I asked the kids if they wanted to ride a camel, of course I didn’t have to twist any arms. My nephew rode with my niece and I had my daughter ride with me, who couldn’t stop giggling. I was pleased she was enjoying herself, that’s all I ever ask for. I received several positive comments on my costume, a few odd requests to touch my nose, and one lady who said she wouldn’t bother having the time, nor the effort to make such a costume. Honestly I don’t do this for me, I do this for the kids. In a way I feel like a big kid. But for two hours I pass out countless pieces of candy to kids of all ages who smile at me, saying trick or treat and thank you. Some kids don’t have a neighborhood to go trick or treating in. And some neighborhoods may not be safe for some kids. So I think this is a wonderful event that the city does that I’m happy to be a part of. Even my four year old niece and eight year old nephew passed out candy. I’m really looking forward to next year! Halloween is in a few days! 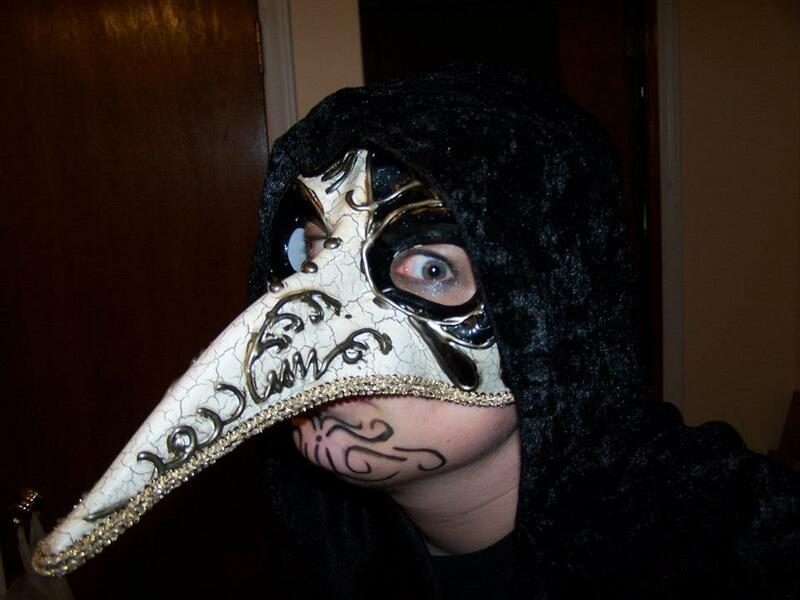 This entry was posted in Blog, Halloween and tagged Arkansas, Benton, costumes, family, Halloween, kids, masquerade bird mask, parents, Raven, siblings, Spiderman, Spook City 2012 on October 28, 2012 by JenniferNAdams.